All British Casino has been on the market since 2012 and has been offering the authentic British casino experience to players not only from the UK, but also from around the world. The homepage loo k is dressed in red, white and blue colours that reflect the British flag. British underground signs, Lambretta or Ben Sherman will give you directions through the site. Even if at first sight, the website might look a bit crowded or chaotic, after a short time you will realize that it has a good structure. The menu organises games into categories, with the most popular at the top. The news and promotions bar keeps customers informed about the latest promotions available. The generous welcome bonus is targeting the UK players, but the casino also offers free spins or promotions for all other players. The trust factor is high with All British Casino, as it holds three gambling licences from the UK, Malta and Curaçao governments. The All British Casino aims to offer the best gambling experience to the UK citizens via its promotions and bonuses available only to those players. Games are easy to find, being stored in a horizontal bar by categories or in a small scroll-able preview mode. The games are easy to play directly from the web browser or from the mobile device. For all the new players, there are handy notes that help with the navigation around the website and the game rules. 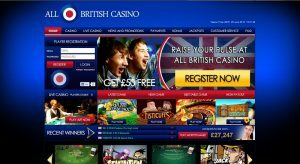 Swedish NetEnt providers fuel the games at All British Casino. All the games are playable through the web browser. No need to download a thing. The reputable developer offers state of the art graphics both on the browser and mobile version for slots, video slots, table games like blackjack, roulette, baccarat, hold’em, live casino blackjack and roulette from Portomaso Casino in Malta and video poker. The new users at All British Casino receive 100 free spins, 100% first deposit match up to £100 and another 100 free spins for Starburst. The free spins have to be wagered 35 times before withdrawal is possible. If a client chooses to decline the bonus, it can be done after registration. Unfortunately, this offer is given only to the UK residents. All British Casino has developed a mobile web page for its mobile and tablet users that is clean and easy to use. It is accessible through the dedicated web browser of iOS and Android devices. Due to strict quality issues, the casino has limited the number of games available on the mobile device. However, a good selection of the most popular games can be played on the mobile site. Deposit and withdrawal have to be made with the same transaction method, as the casino insists. The minimum deposit is £10 for Visa, MasterCard, Skrill, Neteller and Paysafe, while the bank transfer is £30. The Withdrawal limit is between £20 and £5000 per day for all methods, is free or charge and takes 1 day to be processed. The withdrawal requested in the week-end will be processed the next Monday. Before withdrawal process, clients need to send in an ID card, a bank account statement and a proof of address, in the form of a bill from the last three months. The only currency available is in pounds. All customer service assistants are native British and are available 24/7 throughout the year for any questions via live chat, telephone or e-mail service. Live chat is accessible directly and for free through the website, while the telephone number, being UK based, might imply some international call costs for local players. In addition, a frequently asked questions sections is to be consulted for minor queries.